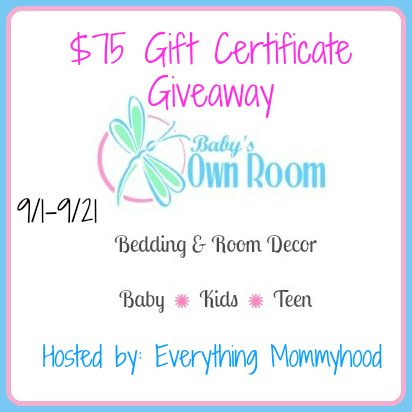 Welcome to the $75 Gift Card Giveaway from Baby’s Own Room!!! Decorating a babies or kids room can be so much fun! I love coordinating all the decorations! Baby’s Own Room has a great selection! One lucky Mama will get to have fun picking out decor for their little one! Baby’s Own Room is an online retailer that sells super cute, stylish, modern, and classic bedding and room decor. They sell many different brand bedding sets such as Sweet Jojo Designs, Cotton Tale Designs, and Whistle and Wink. Their customer service is exceptional with no hassle returns. Check out Everything Mommyhood’s Sweet Jojo Designs Happy Pink Owl Bedding Set Review for a toddler bed as well as a twin bed! 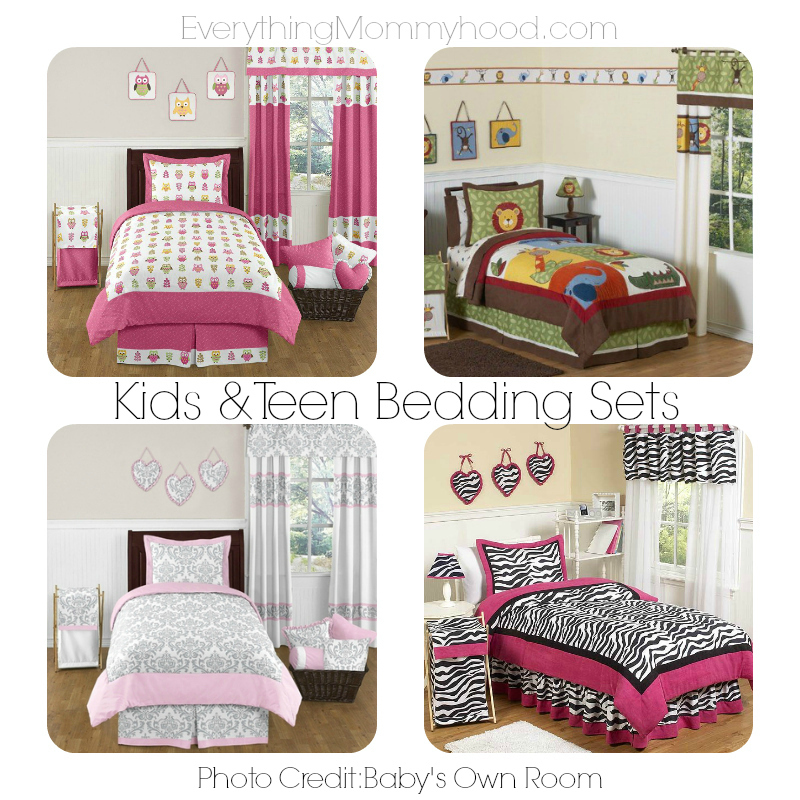 Baby’s Own Room has a variety of Kids and Teen Bedding for boys and girls. They even sell Room Accessories, Crib Conversion Kits, and Cribs! Baby’s Own Room is your one stop shop for everything kids. The best part is, all of their prices are affordable and they offer FREE SHIPPING on ALL orders, NO MINIMUMS!!! 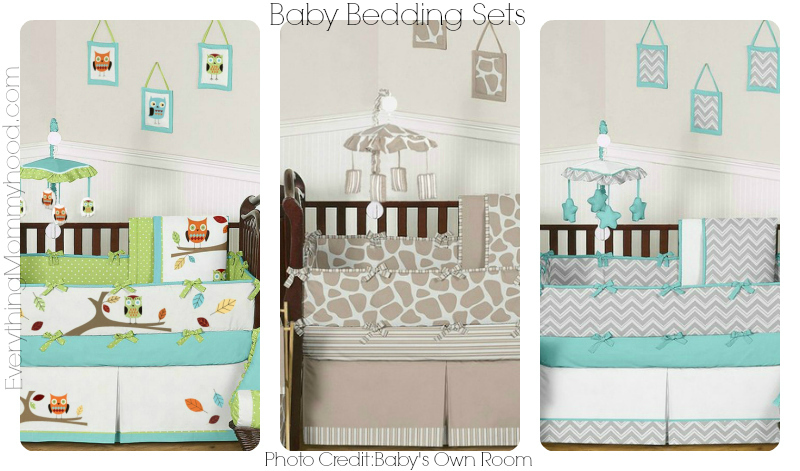 One lucky reader will win a $75 Gift Card to Baby’s Own Room! Love the owls!!!!! Also the teal and gray chevron is cute too! Omgosh, they have some cute stuff! I’m having the hardest time choosing a favorite. Right now I’m leaning toward the Elephant Brigade 8 Piece Crib Bedding By Cotton Tale Designs.